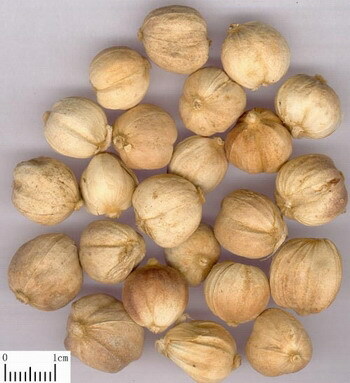 The mature fruit of Amomum kravanh Pierre ex Gagnep or A. compactum Soland ex Maton of family Zingiberaceae. The former is mainly produced in Thailand, Kampuchea, Vietnam, and Yunnan, Guangdong and Guangxi provinces, etc. of China; the latter is produced in Indonesia (Java), Hainan and Yunnan provinces, etc. of China. Collected in autumn when fruits turn from green to yellow. The former is fragrant, pungent and cool in flavor. The latter is slightly fragrant in flavor. Big, full, integrity and strongly fragrant. Dried in sun, unprocessed, broken when used. Pungent, warm; spleen, stomach and lung meridians entered. Resolve dampness and move qi, warm middle energizer and arrest vomiting. It is aromatic in flavor, and is the effective herb for resolving damp-turbidity, moving stagnant qi and harmonizing spleen-stomach. It is usually combined with the damp-resolving, qi-moving and stomach-harmonizing herbs such as Guang Huo Xiang, Chen Pi and Sha Ren. For qi stagnation of spleen and stomach due to food stagnation, it is usually combined with the qi-moving and appetite-improving herbs such as Mu Xiang and Sha Ren. For cold-damp excess, it is usually combined with the stomach-warming and dampness-drying herbs such as Gan Jiang, Hou Po and Cang Zhu. For gastric and abdominal distending, poor appetite and fatigue due to spleen deficiency and qi stagnation, it is usually combined with the spleen-invigorating and qi-tonifying herbs such as Huang Qi, Bai Zhu and Ren Shen. It is fragrant, pungent and warm but not dry. It is good at dispersing and resolving dampness from upper and middle energizer. For the early stage of damp-warm disease manifested as chest stuffiness and no feeling of hungry, it is usually combined with the lung-ventilating and dampness-draining herbs. For instance it is combined with Xing Ren and Yi Yi Ren in San Ren Tang from Wen Bing Tiao Bian. For syndrome of preponderance of heat over damp, it is usually combined with the heat-clearing and dampness-draining herbs such as Huang Qin and Hua Shi. It can move qi and soothe the middle energizer, warm stomach and arrest vomiting. Its action is similar to Sha Ren, but it is fragrant and better at arresting vomiting, so it is most suitable for qi stagnation due to obstruction of damp-turbidity in interior manifested as gastric stuffiness and vomiting. It can be ground into powder alone for oral use or combined with the herbs for resolving dampness, warming middle energizer and arrest vomiting such as Sha Ren, Guang Huo Xiang and Ban Xia. Decoct 3~6g, or grind it into powder to make pill and powder, decoct later.